Community theatre: a full time hobby and passion for those involved, and an opportunity to see our family, friends, and neighbors do something they love. Creating a musical comedy from a story is quite an undertaking, and finding the laughs in Bram Stokers chilling 1897 Gothic horror novel is not a challenge to be taken lightly. The team of Kathleen Palmer and Marion Dunk of Westfield Theater Group rose to the occasion and did just that: wrote a comical, family-friendly take on the original vampire story. The cast of 30+ actors, comprised of WTG veterans and some newcomers, all appeared to be having a wonderful experience on the stage, working together to create an evening of entertainment for an enthusiastic audience. Special kudos to Jay Torres for stepping into the lead role, and doing an admirable job of it, with only a few days notice. Generally, there are no understudies in community theatre, so the company prays to the theatre deities to keep all healthy through the run. Most of the time they come through, but not always. "Dracula's band is ably led by composer/music director Marion Dunk through the 25 (give or take) musical numbers that drive the 2 hour 40 minute show. Several of the numbers are plainly exposition, such as “Woman’s Work," a solo for Keri Klee (role of Mina). No crime there however, as this is oftentimes done in professional theatre as well. A bit of scene stealing is good for some memorable comic moments courtesy of Gene Choquette (Van Helsing), Carol Palmer (Cneaja), Rock Palmer (Sam), and John Farrel (Quincy). For those seeking some enjoyable, family friendly Halloween entertainment, Westfield Theater Group's family, friends, and neighbors provide it with "Dracula." Flashdance” the film is 30 years old, and nostalgia informs much of the stage version of that 80’s touchstone. Even then, the story of a beautiful welder by day/exotic dancer by night with big dreams, took a back seat to the kinetic visual and musical styles of the day. Much dialogue, choreography, and costuming are in direct homage to the film, which makes for a visually arresting show. Without a doubt, the women own the stage. Jillian Mueller, as steel worker/dancer Alex Owens is a delightful triple-threat. She belts songs, dances with abandon, and quickly wins the audience over with her delivery. Many of her numbers were capped by whoops of delight from the audience and much of the show’s success rests solidly in that connection. Alison Ewing and Dequina Moore back up (literally and figuratively) as Tess and Kiki, Alex’s seen it all co-workers. Each is given sharp lines and knockout numbers to perform with “I Love Rock and Roll” and “Manhunt.” Their curtain call prompted the audience to leap to its feet. As befitting a show so firmly rooted in the video age of the 80’s, the scenery is created using spectacular high definition video projections and sliding panels, creating a dynamic and paradoxically organic canvas that is enthralling to watch. The dance numbers range in style from modern, to ballet to hip-hop, but each element seems separate from the other. That said, there are some amazing, physical, passionate performers on display. Five Top-40 hits from the soundtrack are included in the score but it is strange that none of these are sung by the leads. Sixteen additional songs have been written, of which “Steeltown Sky” and “Here and Now” work particularly well, but not all the new additions are necessary. Like its cinematic source, “Flashdance, The Musical” is both visually and viscerally exciting. A jolt of electricity surges through the crowd when Alex performs her famous “water dance” as it combines Mueller’s boundless energy with superb stagecraft. Once again, Goodspeed Musicals has given the theatre-going public a wonderful reason to celebrate. The current production of Frank Loesser’s masterwork, “The Most Happy Fella,” is a glorious, jubilant, triumphant revival. Like virtually every production at Goodspeed, “Fella” could be transferred to Broadway intact, outshining most of the shows already there. 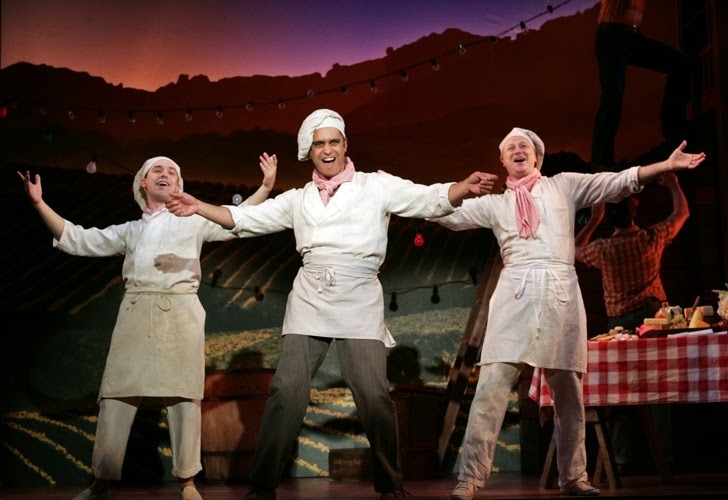 Considered one of the most “musical of musicals,” “Most Happy Fella” is an unlikely romance between a middle-aged grape grower and a young waitress. The setting is a Napa Valley vineyard in the 1950's. The colorful, enormously talented cast seems born to bring Loesser’s wide-ranging score to show-stopping life. In the pivotal role of Tony, Bill Nolte is magnificent. He captures the full range of his character's exuberance, anger, and ultimately, warmth, all backed up by a fantastic voice. As Rosabella, Mamie Parris is perfection in her transition from early disappointments and confusion, to true understanding and love, beautifully expressed with her soaring soprano and sensitive interpretation. Natalie Hill’s Cleo and Kevin Vortmann’s Herman are ideally matched, adding welcome humor at precisely the right moments. Martin Sola, Greg Roderick, and Daniel Berryman each contribute an authentic Italian flavor to the performance in a series of numbers. Goodspeed, with two Tony Awards, is recognized as America’s leading producer of first class revivals of Broadway’s treasure chest of musicals. With the inspired direction of Rob Ruggiero, spirited choreography of Parker Esse, and an outstanding cast, it is easy to see why this is so. Carolyn Kuan opened her third season as Music Director of the Hartford Symphony Orchestra with an imaginative program of three works that featured two contrasting solo instruments. The version of Bach’s Toccata and Fugue in D Minor that began the concert included not only the solo organ for which it was originally written but the full orchestra in a transcription by Leopold Stokowski. Organist Edward Clark and the brass and string players made the most of their prominent roles in this dramatic account. The Bach was followed by an unannounced but delightfully effervescent performance of the rousing Overture to Smetana’s comic opera The Bartered Bride. Like last year, Kuan included in this opening night program not only a piece but also a performer reflecting her Chinese heritage. Wu Man was the crowd-pleasing soloist in Lou Harrison’s Concerto for Pipa with String Orchestra, written in 1997 for a festival celebrating the 80th birthday of the Oregon-born composer, who died in 2003. The pipa is an ancient Chinese lute with a short neck and four silk strings, and Ms. Wu was the soloist in that 1997 premiere. A highly charged reading of Saint-Saens’ Symphony No. 3, the “Organ Symphony,” followed intermission. Clark again played the Bushnell organ with appropriate languor in the lush Poco Adagio second movement and majesty in the maestoso finale. The full orchestra played all four movements with excitement and precision. A notable result of Maestra Kuan’s educational outreach efforts to the local community was the participation in the Bach and Smetana pieces by members of the Connecticut Youth Orchestra. Prepared by their Music Director Daniel D’Addio, they blended seamlessly with the HSO. 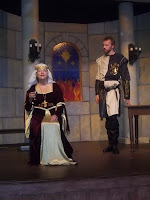 With the leonine Robert Lunde as King Henry II of England and the regal Debi Freund as Eleanor of Aquitane, "The Lion in Winder" unfolds on the Suffield stage in all of its 12th Century royal panoply, intrigue, and chicanery. The gorgeously costumed family Plantagenet is as dysfunctional and love-hungry as any group could ever be, and all in it are masterfully portrayed. Will Matus is the eldest son, Richard the Lionhearted: tall, handsome, and soldierly; his brother in the middle, Geoffrey, is played by Nathan Rumney with conniving perfection; and Christian Tarr is “to a T” the callow youngest, John. These three young men are certainly King Henry’s boys reincarnated on the stage at Suffield Players' Mapleton Hall. Marisa Clement plays the lovely Alais, Henry’s mistress, raised by Eleanor to be the eventual wife of Henry's heir -- until Eleanor was imprisoned ten years earlier by Henry for leading a revolt. To round off the cast, Brian Rucci cleverly provides a great deal of comic relief as Alais’s brother, the new young King Philip of France, but a “foolish boy” to Henry. Lunde's and Fruend's characters glibly toss barbs back and forth as they scheme to get their own different favorite son to become successor to the throne. Of course, there are three sons, and only one can be king, so parents and children take and change sides as they machinate into a thrilling conclusion, leaving the audience gasping in a rush of adrenaline. Suffield mounted this play in the 70's, and is one of the few plays they have brought back to their stage – and a finer revival could not be imagined. The Springfield Symphony Orchestra opened its 70th anniversary season with a program of three works that had “optimism and excitement bursting from every seam,” as Music Director Kevin Rhodes described his goal for opening night in a program note. After a stirring performance of The Star-Spangled Banner to mark the start of a new season and brief introductory remarks from new SSO President John Chandler and new SSO Executive Director Audrey Szychulski, the formal concert began with an exuberant romp through Shostakovich’s uncharacteristically upbeat Festive Overture. Brass and percussion members especially relished their featured roles, but everyone played with polish and good cheer. The orchestra and soloist Gilles Vonsattel next tore into the jazzy start of Ravel’s Piano Concerto in G Major with gusto. The high energy level continued through the Gershwinesque first movement and the fleet closing Presto. But the heart of the concerto is the central Adagio, in which a dreamy waltz is introduced by the solo piano and later picked up by the woodwinds and eventually the whole orchestra. With a flowing and flexible tempo, soloist and ensemble fully realized the hushed radiance of this sublime movement. The Swiss-born Vonsattel, winner of several international piano competitions, Juilliard School graduate, and now an Assistant Professor of Piano at the University of Massachusetts, earned an instant standing ovation from the enthusiastic audience. Intermission was followed by a dramatic account of a piece that Rhodes first played with the SSO when he was a candidate for his current position in November 2000, Tchaikovsky’s Symphony No. 4 in F Minor. After a blazing brass fanfare denoting “fate,” a broader than usual tempo heightened the contrasts among the multiple themes of the long first movement. The Andantino second movement was poignant and reflective, while the Pizzicato scherzo was delicate and playful. Maestro and orchestra pulled out all the stops for a thrilling finale, and every section played brilliantly throughout the evening. Along with the welcome return of the “Rhodes’ Reflections” column to the program book, this notable opening concert promised an exciting season ahead. The universality of Shakespeare’s “Othello,” is demonstrated in Playhouse On Park’s production of this saga of jealousy, deception, and passion. Director Sasha Bratt moves the action into a sparse and desolate contemporary setting described as: “An all too familiar world of constant war,” with a cast dressed in army camouflage, carrying automatic weapons. The set design reinforces the focus of this production on character and motivation, through its simplicity, using fabric and draperies to create the changing settings. The multiple scene changes are smooth and well choreographed. Our re-introduction to the many familiar characters is carried off with particular skill by Tom Coiner (the ever scheming Iago), and one of his many unwitting companions/victims, Austin Seay (the ever-trusting Roderigo). The interplay between these two actors is a refreshing take on the characters, delivered with a believable contemporary cadence and attitude. Coiner switches affect and presentation, with the cunning glibness of a sociopath, and Seay follows his lead like a witting, yet pitiable, dupe. Likewise, Aiden Eastwood-Paticchio as Cassio presents a youthful naive quality that leaves him sadly open to the treachery that surrounds him. The other two key players in this tragedy, Othello and Desdemona, portrayed by RJ Foster and Celine Held, deliver their roles with a more ‘traditional’ characterization, which certainly carries the theme and action of the play, yet leaves desire for more vulnerability and humanity. For those who enjoy Shakespeare, and the many diverse times and settings in which it can be played, and reinforce its relevance and insight into who we are, what we do, and why we do it, this may be a version to add to your experience. There will be a moment during this production, this glorious and beautiful and heartbreaking production, where audience members will see themselves in a character, and likely not share it with anyone but themselves. 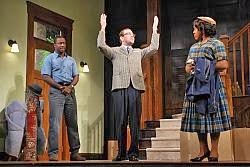 Act I takes place in 1959 in the house at the center of the novel A Raisin in the Sun; Act II is 50 years. Throughout the play, the audience realized that a lot has been said about race relations, but is anyone listening. Clybourne Park, masterfully crafted by playwright Bruce Norris, attempts to bring to life the important ideas, history, and truth that humans can’t seem to say out loud to each other. Giovanna Sardelli is a director who is fierce in her ability to tell a story simply. She somehow never gets lost in her journey, and with razor sharp control she delivers a production that makes the original Broadway show a far away memory. Russ and Bev Younger (Remi Sandri and Carol Halstead) reveal motivation in selling their home to the first black family in a white zip code. It isn’t a pleasant view from inside the nearly empty living room or the equally barren marriage. Banalities replace conversation as the two characters wonder about everything except a certain dark truth that brought them to this place. As the neighbors stop by in vain attempts to get them to not sell to the black family on their way, they also try and fail miserably to sound like anything other than the racists they are. Act II – flash forward a half-century – and the walls of the house have been torn down. In a mirror image of language and rhythm through the lens of modernity, the coin has flipped. A young, erudite white couple has decided to begin the gentrification of the neighborhood by purchasing the home only to tear it down and build an even bigger monument to good intentions. This news has not come happily to the Historical Society. In a diatribe about history and preservation, the truth is merrily danced around, sometimes politely spoken and avoided handily. In the end, the playwright and his characters all have so much to say and yet so little time to listen. This is Clybourne Park.